Subergorgia mollis (Nutting 1910). Fan-like colonies, uni-planar, inter-branched in a rectangular fashion every 10-60 mm. . May be 2-3 meters in diameter. Thin branches (1-3 mm). May be pink-orange or red if overgrown with epizoics. Western Pacific. Fiji pix. Alcyonium sp. Indo-Pacific Sea Hand. to about six inches. Needs dim light, to be fed planktonic food at night. 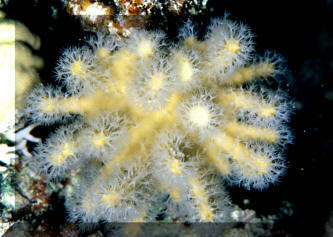 Looks like a lump by day, with enlargement, extension of elongated, clear polyps by night. Fiji at night. 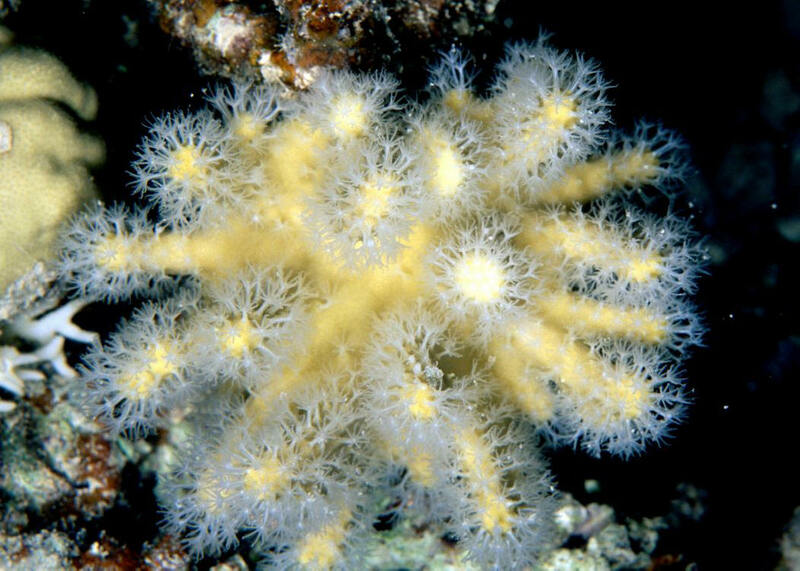 Lobophytum sp. Lobed Leather Coral. Made of several robust lobes, closely-set. Greenish to yellowish brown in color.